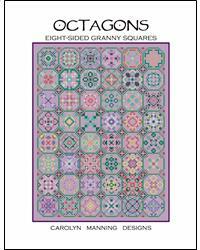 The first in my new Octagon Collection featuring 48 8-sided granny square inspired octagons. Finished stitch count for all 48 together is 115w x 153h. Stitch them all together or stitch the motifs separately. Each octagon measures approximately 1 1/2" x 1 1/2" on 14ct. 20w x 20h. Charted with DMC floss but the perfect piece to use your bits of this and that.